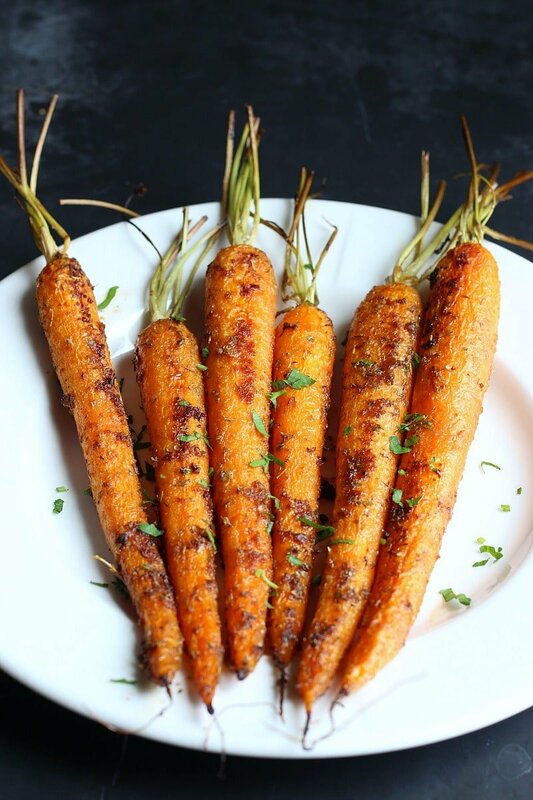 Whole carrots coated with an aromatic garlic, thyme and oregano infused oil and roasted to perfection! It’s time to give one of my favorite vegetables a mega spring twist. 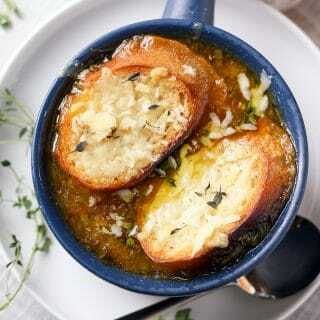 I love carrots in Beef Stew, Pot Roast and Soups more then anything, but considering we are moving towards the warmer weather and I likely won’t be making any of these winter recipes for a while, it’s time to dress up the carrots for the summer. 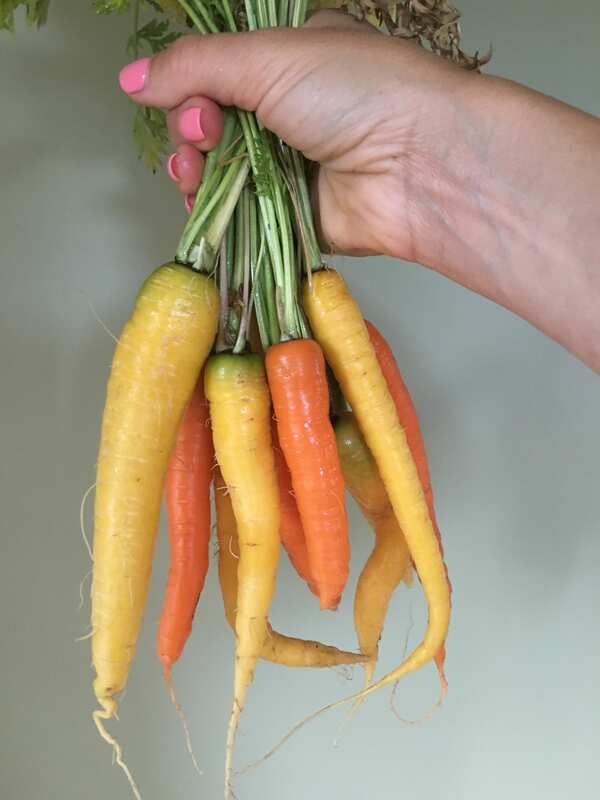 It won’t be long until my own carrots are growing and ready to pick, but until then my farmer’s eyes can spot a fresh bunch of carrots from a mile away, and I am certainly not passing up on those. Fresh carrots (as in… just picked!) like this beautiful bunch I am holding in the picture below, are so much tastier, sweeter and less harsh and bitter. It’s the one crop I have success in planting year after year, whether there be in the garden or in containers, little can go wrong with growing carrots! 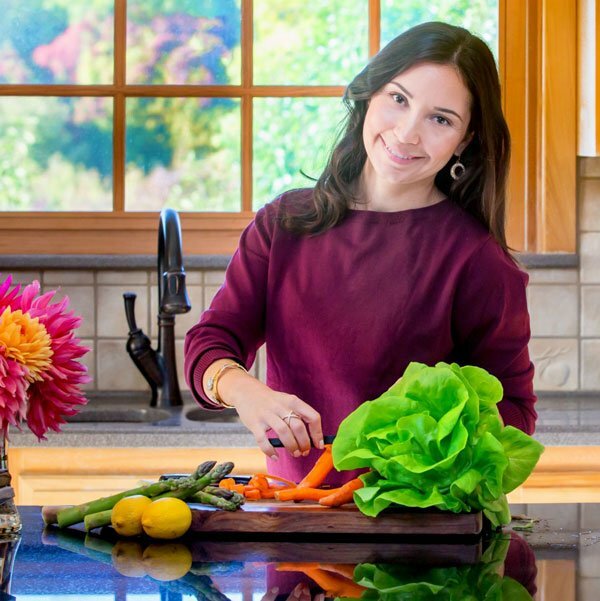 Check out my Vegetable Garden Guide for Beginners! 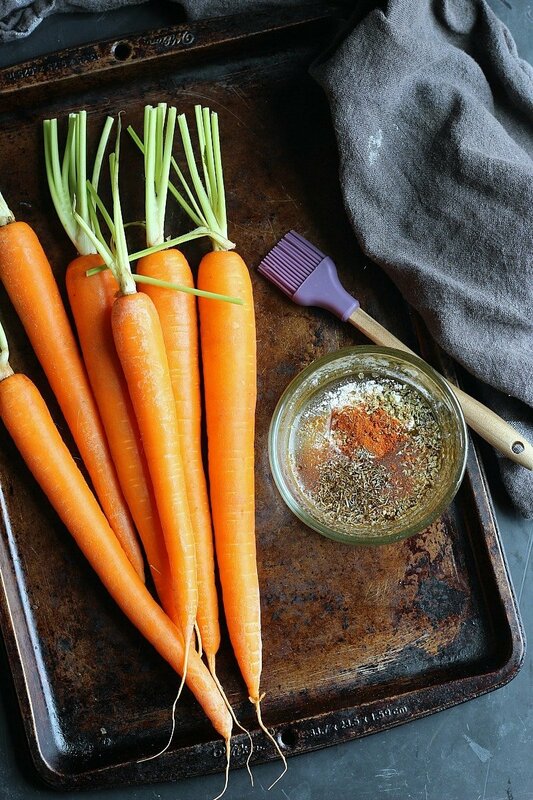 Next time you spot a fresh bunch of luscious looking carrots, GRAB IT and try this recipe. 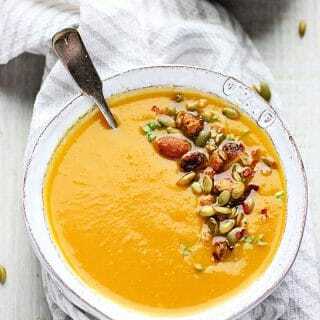 You will love every bite of it, the herb infused oil give it a nice flavor while maintaining the carrot’s sweetest taste. In this recipe the whole carrots are coated with a delicious mix of aromatic spices, garlic and oil and roasted to perfection. 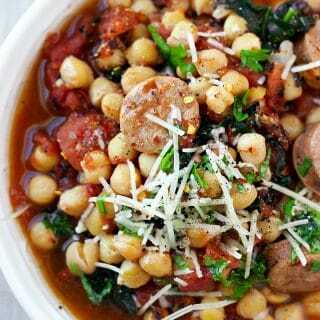 This recipe makes for a tasty side dish that is easy enough for any day of the week or an eye catching vegetable side for any special occasion. 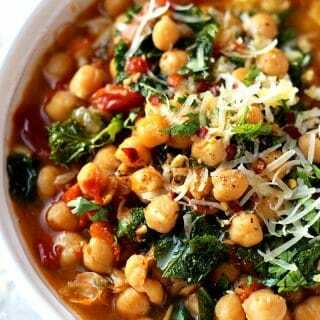 This is a family favorite recipe. Kids will enjoy a ‘fun size’ carrot styling their plate, just as much as the adults do. Enjoy! 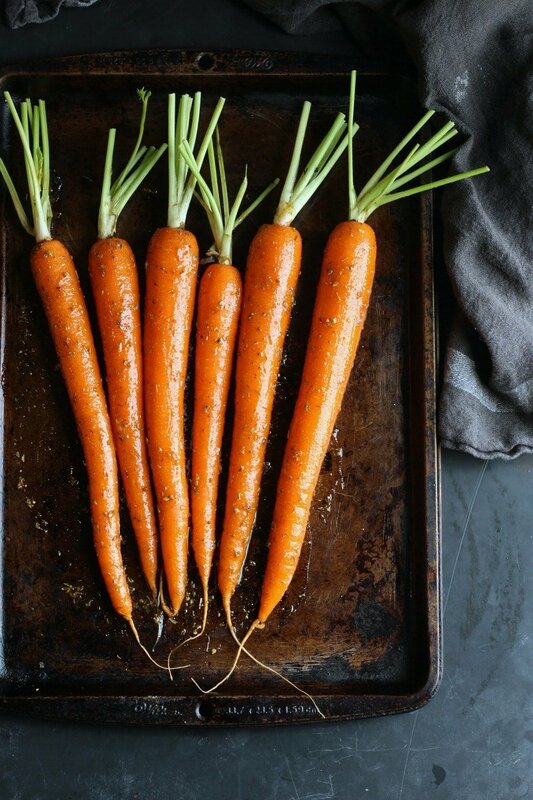 Wash your carrots with a vegetable brush and rest them on a kitchen towel. 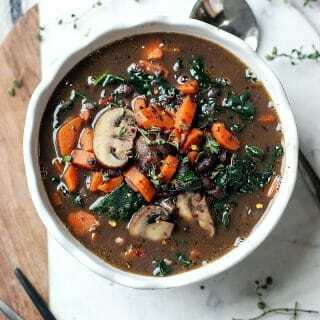 In a small glass bowl add the remaining ingredients and whisk to combine. 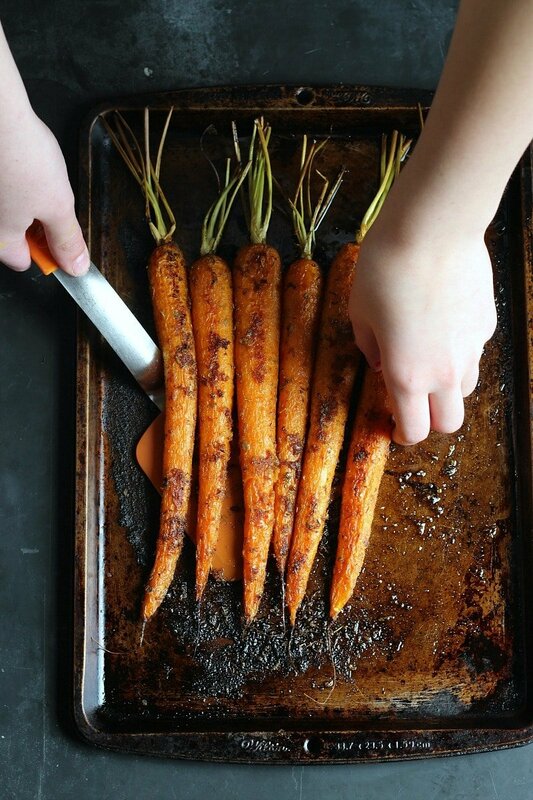 Transfer the carrots to a baking sheet. 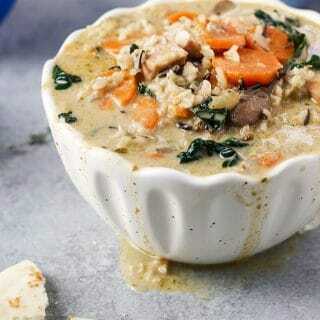 Pour the oil mixture over the carrots. Either use your hands or a brush to make sure the carrots are evenly covered. If the heat in your oven is coming from the bottom, place the carrots on the top rack. If the heat comes from the top, place the carrots on the lower rack. Bake for 15 minutes. Turn the carrots and bake for 10 more minutes. 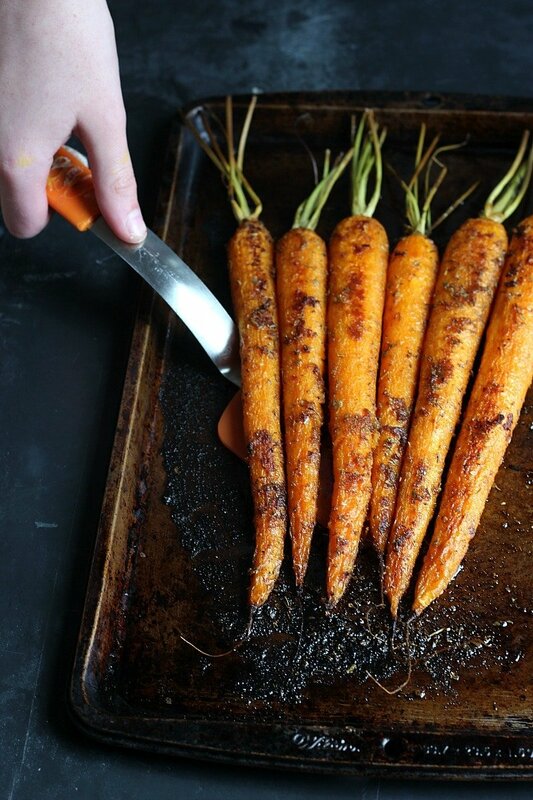 Why have I never roasted carrots like this before? 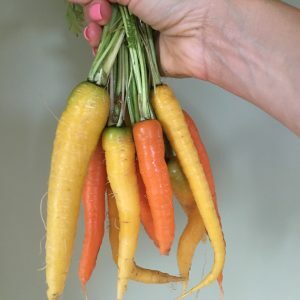 These look so delicious, and they’re probably the most BEAUTIFUL carrots I’ve ever seen in my life! Love the photos, and I’m so impressed by the fact that you’re growing your own carrots. I can’t even keep my basil plants alive haha. You’re very welcome, glad you like it !